The G. Caporale Institute has acquired a cutting-edge system: a class PCL4 mobile laboratory with high biological containment. 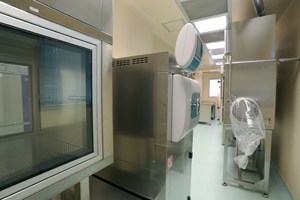 The new lab, the only one in Italy designed for the veterinary profession, combines the latest instruments for diagnostics on samples of pathological material and the study of new methods for detecting, identifying and characterising micro-organisms, and has two fundamental characteristics: biosafety complying with international standards, and total portability. 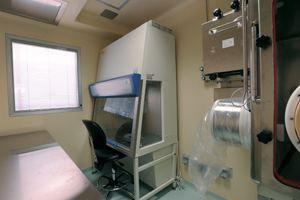 The laboratory, which consists of three units (two operational units and a support unit), can be transported very quickly to areas affected by emergencies, ensuring constant compliance with biosafety levels conforming to international standards; the units are leaktight towards the exterior, so that laboratory personnel can work in a totally sterile environment, thus minimising the risk of contamination of the external environment, the material being tested or the examiner. Natural and artificial propagation of infectious agents increasingly originates from the less developed parts of the world, as movements of people, animals and products brought about by globalisation can cause serious problems for the developed countries too. This risk situation requires a rapid response, which is all the more effective when it immediately reaches the areas from which the agents originate. controlled access to the research and experimentation areas. The particular versatility of the structure makes it suitable for a variety of uses, ranging from pre-marketing testing of veterinary drugs and investigating diseases common to animals and humans to extreme situations involving germ warfare. 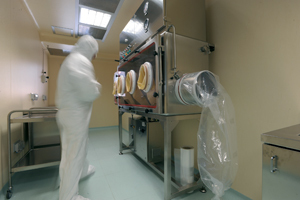 class III biohazard hood to BS EN 12469 standard for sterile work on biological material. 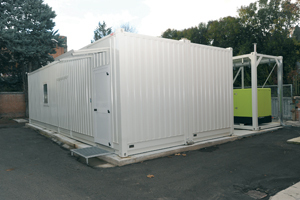 Each module is designed to allow rapid dismantling and reassembly of the mechanical connections between container 3 and containers 1 and 2, and the elastic connections between containers 1 and 2. The laboratory complies with the applicable legislative provisions for the following classification: BL-3N (container 1), BL-2 (container 2).